Preheat oven to 425°F. Combine finely diced butternut squash with 2 tablespoons olive oil and season with Kosher salt on an aluminum foil lined baking tray. Roast in oven for 20 to 25 minutes, until squash is fork tender. Meanwhile, heat remaining 1 tablespoon of olive oil in a medium skillet over medium-high heat. Add lamb, rosemary, sage, onion powder, garlic powder, and season generously with Kosher salt. Brown lamb, breaking up into bite-sized pieces and stirring, until fully cooked. 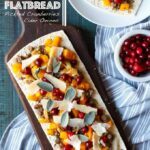 Bake Flatout pizza crusts in oven for 2 to 3 minutes, until warmed through.Top with roasted butternut squash, ground lamb, cider onions, pickled cranberries, and grated parigiano reggiano cheese. Garnish with fresh sage. Devour. Heat a medium skillet with over medium heat. Add the onions and cook for about 8 to 10 minutes, stirring frequently, until softened. Slowly add cider, letting it cook into the onions before adding more. Do this until all the cider is slowly absorbed and the onions are very soft.